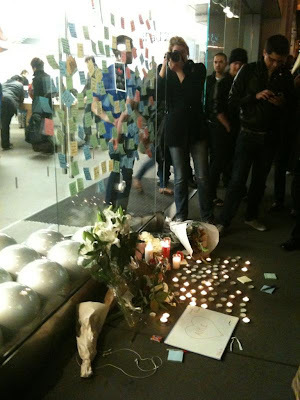 That's a picture taken by Matt Harris of the spontaneous memorial to Steve Jobs in front of the Apple San Francisco store tonight. I am moved by this. I am kin to the people who did this. And yet earlier today, I invested hours and a big chunk of money into procuring and ferrying supplies for the Occupy San Francisco folks. The Occupy Wall Street movement is a protest of the unjust wealth—and more importantly, of the unjust power—of the wealthiest people in America. And make no mistake, Steve Jobs was one of those guys. Let me underline that. I hesitated to say this today, not wanting to speak ill of the dead, but it's important to understand that an important but mostly-unhearalded part of Steve Jobs' business mojo was his understanding of manufacturing. It was the main focus of his attentions during the last few years before he was forced out of Apple in the mid-80s, and his attention to manufacturing is integral to Apple's current ability to field devices that deliver more for the money than competitors. So when it came out that conditions in Chinese iPhone factories were so horrific that workers were driven to suicide, there was no doubt in my mind that while he likely didn't know the specifics of the story before they came out in public, he did know fundamentally the kind of work situation at his suppliers. When the story came to light, Jobs didn't rush to change what Apple was doing but rather actively defended what Apple had done. I am very clear on that. I am very clear that though this may be the most horrifying skulduggery Apple has perpetrated at Jobs' direction, it's not the only example by a long shot. How can I reconcile this with the urge to be among those building an altar to a fallen CEO? Let me offer something I have said about Apple under Steve Jobs for years. Apple is a vast machine for making exactly the tools that Steve Jobs wants for himself, and in order to pay for the exorbitant cost of making them it sells copies of Steve's toys to all the rest of us. People in the industry chuckle when I say that because it describes an important part of how Apple works, but I say it now in order to confess that there's an important way in which my quip gets it exactly wrong. Just yesterday I pointed to an article by blind blogger Austin Seraphin saying that the iPhone is “the greatest thing to happen to the blind for a very long time, possibly ever.” Apple has aggressively worked on accessibility for users who are blind or deaf or have other limitations, an effort that makes no “business sense” but surely makes human sense if you read that or any of the countless other articles about what a boon the iPhone has been to the blind. Today I see Susie Bright saying that her pioneering magazine of lesbian liberation, On Our Backs , was not just the first magazine created on the Mac. It was only possible to publish it because of the Mac. Both of these stories, and countless others that people are telling today, tell how Apple products empowered and delighted them in ways that are impossible to imagine without Steve Jobs. Speaking for myself, the profession which I practice and love could not exist in the form I enjoy today without the Macintosh and its success and the influence it has had, so in an important way I owe the life I love to Steve Jobs. That is what Apple is for. Yes, Apple makes money, but that is instrumental to its true purpose. That was what Jobs' life was about. Yes, Jobs made a mountain of money himself and had his legendary ego gratified, but those are byproducts of his mission of making beautiful things that deliver power and pleasure to people. There are more important things, yes, but that's pretty darned good. 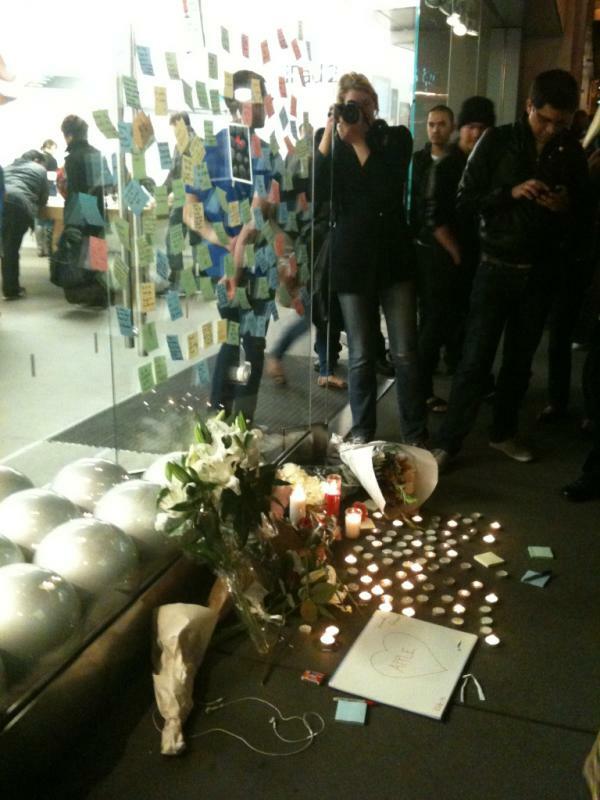 It's why people are laying flowers at the door to his store, and why I am with them in spirit. Is such a memorial to any other CEO even conceivable? Is it all that hard to see why it isn't? I'd leave it at that but there's just one more thing. 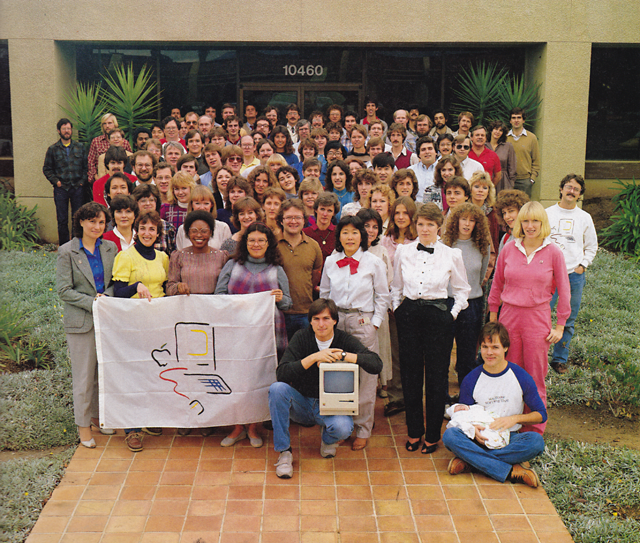 I dig this picture of the original Macintosh development team blogged in a fascinating remembrance by John Siracusa. Notice that there are a lot of women in that picture? That it's mostly White people, but not entirely? Both in an era when tech skewed even more White and male than it does now. And notice that there's a fella holding his baby right in front there? This sure looks to me like a shaggy bunch of goddamned hippies who have cleaned up for Picture Day. Which is no surprise: Jobs himself was a goddamned hippie who once lived on an ashram and dropped acid and did his major corporate announcements dressed in a black turtleneck, jeans, and sneakers and referenced Gandhi and Bucky Fuller in advertisements and thought that finally adding the Beatles to iTunes was an announcement on a par with launching a whole new product line. Jobs was a hippie who built a hippie organization. I submit that it's no coïncidence that this hippie organization is now arguably the most successful company in the world. Because while we shouldn't pretend that Apple isn't ruthless, isn't exploitive of its workers, isn't deeply concerned with bean counting, and all that, just doing those things doesn't explain Apple's success, either in making money or in inspiring love. Making great products and services that serve people is what did it. And that, I submit, comes of taking a bunch of smart oddballs and giving them a mandate to do something great. That comes out of a culture, not just in the sense of “corporate culture” but in the sense of culture at large. Yes, this was a useful articulation, thank you. Also, beautifully written. I'm still conflicted, but this brings me closer to understanding. Just for factual accuracy, I feel compelled to point out that the suicide rate at the iPhone factory is below average for either rural or urban China, so if anything, those statistics are a credit to Jobs; or more likely, just totally irrelevant. Choosing a factory with a below-average rate of despairing suicide isn't good, it's just less evil. There's a difference. Yes, steve jobs is comparable to greats like newton,einstein,edison and others.Shame that he was NOT Given state funeral by USA or World befitting one of the greatest human beings ever born, may be because steve jobs believed in philosophy of eastern religions, namely buddhism and hinduism, Steve Jobs was NOT given state funeral and honours. Of course if he had belonged to hate-filled seetic cults, christinity or islam, both america and europe would have given state honours and state mourning, that is the octopus control of vaatican and jehadis all over the world, right,folks?? ?